The bluebells are particularly spectacular this year and the sea-trout have started to run the rivers – I had my first of the season from the Dyfi on Tuesday night 6lb and fresh off the afternoon tide. 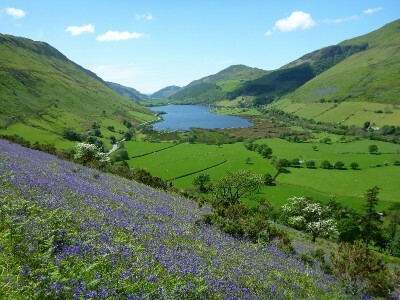 Lorraine took a series of stunning pictures of Tal-y-llyn and the bluebells earlier this week, just in time as the rain seems to have flattened them! Morgan had his last rugby match of the season last weekend and scored 5 tries in beating Newtown over two matches. He’s now playing golf 3-4 times a week and hitting the ball further than his mother!!! 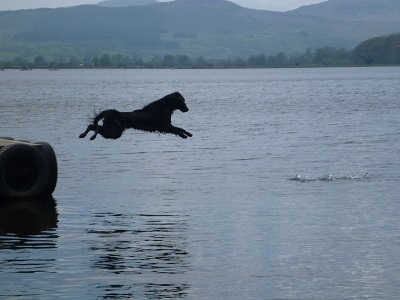 It’s half-term next week so he’ll be off fishing and golfing everyday while we have too work – maybe I’ll be able to sneak down to the river after dinner on a couple of nights!! The kids have gone back to school, the cuckoos have arrived and are calling across the valley behind the house – probably looking for nests to hijack and the Dyfi Ospreys should be laying their first egg any day now. Things have quietened down in the B&B after one if busiest Aprils on record. We took this picture of the adventure sports dog (Oggie) on our way back from Bala yesterday having picked up the newly framed painting of Cadair Idris for our Wnion bedroom. Due to two last minute cancellations we do have a room free for this weekend. Don’t miss the new BBC Wales Crime Drama ‘Hinterland’ on BBC4 on Monday nights – it’s filmed around Mid-Wales and is superb!